? 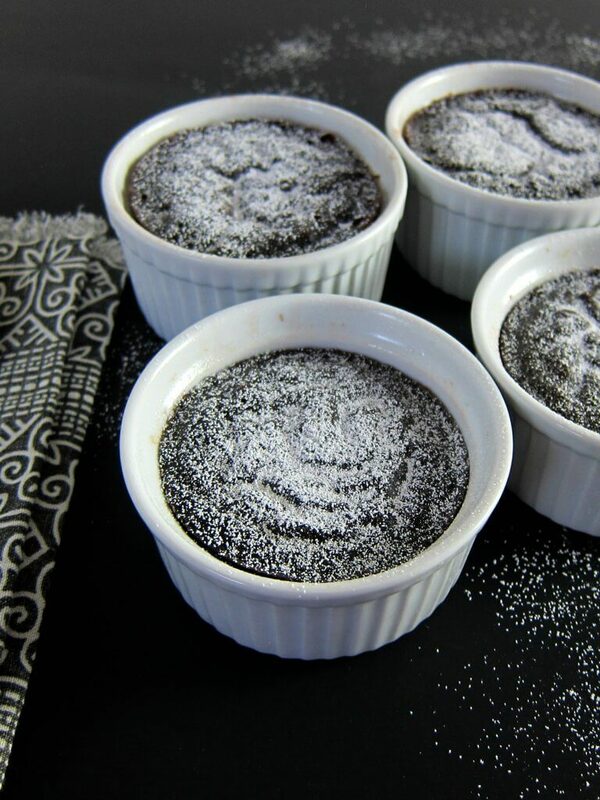 The answer is a resounding “yesss!” These molten Instant Pot chocolate lava cakes are such a wonderfully decadent treat! We were in the mood for dessert and of course, now that everything in my kitchen revolves around the Instant Pot, I just HAD to come up with an Instant Pot dessert. I thought about making an Instant Pot cheesecake recipe because I know they turn out really well. 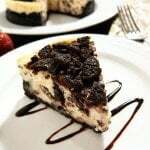 But because I’m the only one in my family who loves cheesecake, I would probably end up eating it all. Not cool. So because everyone loves chocolate, I decided to try out this recipe which I normally make in the oven. The list of ingredients is short and so is the time required for prep, so I would consider this an easy recipe! And one more thing – you’ve got to eat these chocolate lava cakes warm! I make a lot of curries and highly spiced dishes in the Instant Pot and one thing I’ve found is that the Instant Pot sealing ring retains the smell of whatever I cook. I’ve tried all kinds of tricks and they work okay but not perfectly. from amazon that I use for desserts, oatmeal, etc. You might want to consider getting an extra one for yourself if you plan on making desserts or anything that’s mild. but you could also use glass Pyrex custard cups. They’re a bit of a tighter fit, but you might already have them in your kitchen cabinet. I use 6 oz. 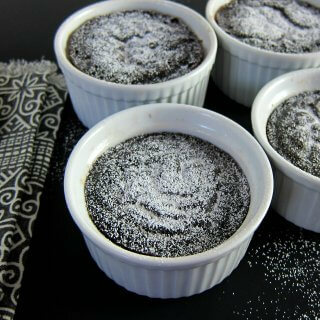 ramekins in a 6 quart Instant Pot Duo or Instant Pot Ultra for this lava cake recipe; if you’re using different size or type of containers or pressure cooker, your cooking time may need to change. This lava cake recipe uses instant coffee granules and I think it adds a nice counter-balance to the chocolate. But I’m a coffee drinker and love to get my coffee fix! My kids, on the other hand, are not coffee drinkers and they like these chocolate lava cakes without the coffee. If you don’t care for coffee either, you can easily leave it out. It’s important that you microwave the chocolate correctly: at medium (50%) power, in small bursts, stirring well every 15 seconds, and stopping when there are still a few pieces of chocolate still left, allowing the remaining chocolate to melt in the residual heat, stirring until smooth. 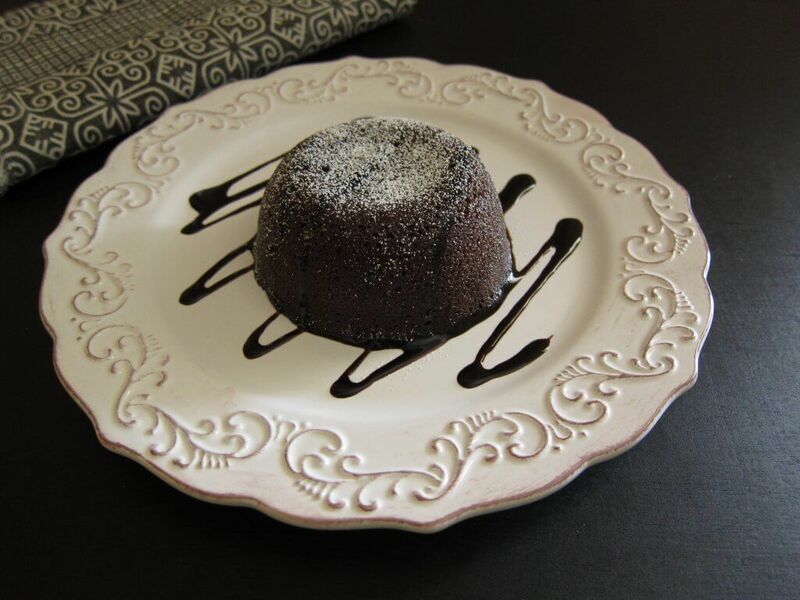 This Instant Pot lava cake recipe can be tricky for some readers. The reason could be altitude-related or slight variations in the measuring of ingredients. The pressure cook time for this recipe may also vary based on model of Instant Pot. If you’re making this Instant Pot lava cake recipe for the first time, you might want to try 7 minutes and if the lava cakes are undercooked, pressure cook them for another 1 to 2 minutes. 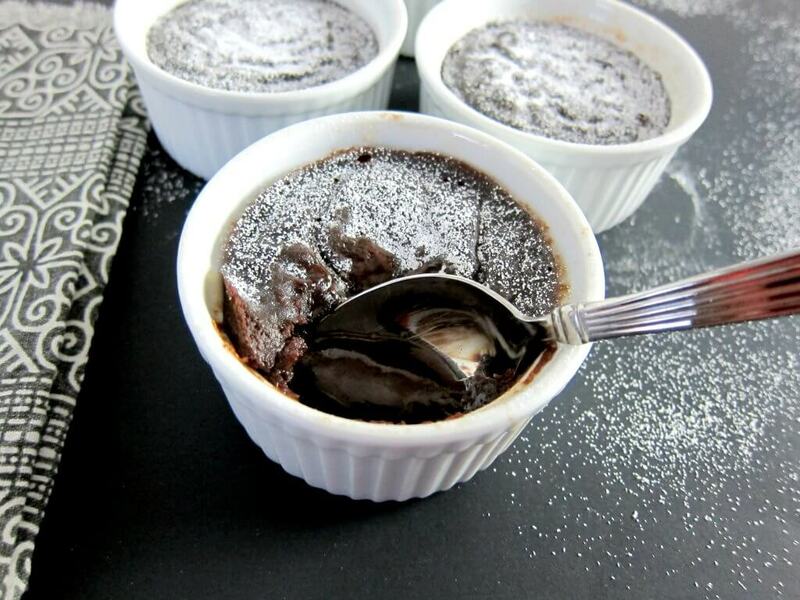 If you’re new to the Instant Pot and aren’t familiar with how to use it, please read the Instant Pot DUO Beginner’s Quick Start Guide or the Instant Pot ULTRA Beginner’s Quick Start Guide first and then come back here to learn how to make Instant Pot chocolate lava cake. * Make sure you don’t over-melt the chocolate. See this article about melting chocolate in the microwave. Whisk in eggs, yolks, coffee and vanilla. Grease the bottom and sides of four 6 oz. ramekins. Coat each with sugar. Pour 2 cups water into the Instant Pot’s main compartment (inner pot) and place trivet in water. Place 3 ramekins on the trivet and stack a fourth ramekin on top. * The pressure cook time for this recipe can vary based on model of Instant Pot. If you’re doing this for the first time, you might want to try 7 minutes and if the lava cakes are undercooked, pressure cook them for another 1 to 2 minutes. The display will count down from 9 to 0; it will switch to ‘Keep Warm’ mode and display ‘L0:00’. Remove the ramekins carefully. I just lift the trivet to remove them. Place the lava cakes on a cooling rack to cool for a few minutes before serving. Dust the Instant Pot chocolate lava cakes with powdered sugar. If you want to turn the cake out onto a plate, run a knife around the edge of the baking dish, place a plate over top and holding both steadily, turn the dish upside down. The cake should come apart from the dish and sit on the plate. Sprinkle with powdered sugar. These molten Instant Pot Chocolate Lava Cakes have a gooey chocolate center and a hint of coffee; A delicious Instant Pot dessert that's super easy to make. Grease the bottom and sides of four 6 oz ramekins. Coat each with sugar. Melt the chocolate and butter: In a medium-sized microwave-safe bowl, microwave butter and chocolate on medium heat for about 1 minute. Stir and repeat heating at 15-second intervals, until the chocolate is melted and smooth but a few small pieces of chocolate still remain. Keep stirring to allow the chocolate to completely melt in the residual heat. Place 3 ramekins on the trivet and place 1 more on top of them, in the middle (staggered). Close the Instant Pot. Make sure the steam release handle is in the ‘Sealing’ position. Do a Quick Release of steam and open the Instant Pot. Use the trivet to remove the ramekins. Gently dab off any condensation from the surface of the cake. Dust the Insant Pot chocolate lava cakes with powdered sugar. If you have a larger Instant Pot, you might be able to fit all 4 ramekins in one layer. I use 6 oz ceramic ramekins and a 6 quart Instant Pot Duo and Ultra for this recipe as written; if you're using different size or type of containers or pressure cooker, your cooking time may need to change. See blog post for more details and tips. This was such a helpful posting. Thank you! I am a loyal fan of Paint the Kitchen Red. I especially dialed in to what you said about the coffee granules enhancing the flavor of chocolate, as Ina Garner, the Barefoot Contessa, recommends that bakers do so to enhance and deepen the chocolate. Like you, I am not coffee drinker, and since my mother is a loyal follower of Ina, as I am of you, she uses coffee granules in all her chocolate cakes and brownies.Though I seldom bake, I would argue as a non-coffee drinker that one can taste the coffee influence, and I don’t like it. Maybe that’s a good thing, as I can taste the coffee every time. In light of my sensitive taste buds, I am delighted by your comment that it can be left out. You really do cover all the bases! Thank you for offering alternatives. My taste buds are especially grateful. Thank you for following the blog and for your thoughtful comment. I’m a fan of Ina Garten too! I thought it was just my kids who notice the taste of coffee, but interesting that you are sensitive to the taste too! You’ve taught me something. You may also use an almond or hazelnut extract if you prefer them to the coffee. What a great idea, didn’t think of that! I love the taste of almond. Thanks for sharing. If you keep posting great ideas like this I am going to have to get an Instant Pot. I love lava cake. Do you think this recipe would work in a bain marie? Any idea how long it might take if it would work? The recipe I use for the oven doesn’t require a bain marie. Just bake at 400 degrees F for about 12 minutes. You can also make it in a stovetop pressure cooker, but reduce cooking time by 2 minutes. These are so pretty! These would be perfect for a special Valentine’s Day dinner at home. You really can make anything in the Instant Pot, can’t you? Thanks Riva! They would be perfect for Valentine’s Day. Add a heart shaped strawberry on top – perfect! What can’t you make with the Instant Pot?! Love this! The chocolate lava cakes look so delicious. I love the addition of coffee granules to enhance the chocolate flavour too. Thanks Marie! I have a sweet tooth and was very excited to make Instant Pot desserts! I will need to try out my other favorite in the Instant Pot – creme brulee! Yes, Alison – stovetop pressure cookers reach pressure and temperature faster than the electric. The times do vary from pressure cooker to pressure cooker so you might have to adjust the timings. This looks delicious! I love lava cake and the addition of the coffee makes for a much richer, tastier chocolate flavor! Saving this recipe for when I get an Instant Pot! I agree – coffee adds a nice touch! Try it in the oven if you don’t have an Instapot! Thanks Mikaela – It would make a great Valentine’s Day dessert. Oh, and IT IS good with ice cream or even whipped cream….. ! Excellent advice about getting an extra sealing ring for desserts and such. I wouldn’t have thought of that! Thanks Erica! Some people have luck with lemon juice and denture cleaners to clean to Instant Pot sealing ring, but I was not satisfied with those solutions! Wow I had no idea you could use the instapot like this! Multi-purpose I love this! 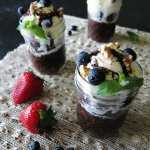 Little chocolate pots of yum! Thanks for this Neena! WOW. This looks GREAT! Thank you for sharing the step-by-step photos! Thanks Jamie! I didn’t think an Instant Pot dessert could come out so well! And so easy! Have you ever tried stacking the ramekins and cooking all 4 at once? Do you think the time would change? Regardless, can’t wait to try!! I haven’t stacked these yet (I will be making this weekend for the Father’s Day crowd), but I have stacked for crème brulee and it works perfectly. With those I cover with aluminum foil so that the moisture doesn’t drip from the one on top, so I may try that with these too. I tried cooking all 4 at one time. They were delicious, but no lava! I find this surprising. You would think cooking more at once would require extra time. I guess we will just have to try it again with less time, Thank you for the delicious recipe! Hi Susan – did you increase cook time or leave it the same? Generally increasing quantity doesn’t require more time unless the size of the food is larger (e.g. larger piece of meat or container). One thing you might watch out for is over-melting the chocolate. Also using a different size of ramekin or custard cup can alter the results. I’m glad you like the recipe, though and thanks for your comment! I made this tonight, and it came out very differently than expected. Instructions were followed to a tee, but there was no liquidy, lava center, and the texture was much more baked-egg firmness than a cake-y sponge. Any suggestions as to how it went wrong? My best advice would be to try it again, and cook for a shorter amount of time – I think you can reduce the time by 2 minutes to start. It’s hard to say what went wrong – could be the consistency of the batter, maybe a bit more flour than I used… Good luck and thanks for sharing. I had this bookmarked for more than a week. Tried it last night and it turned out really awesome. I just purchased an Instant Pot DUO80 and am looking forward to learning how to use it. Hi Earl, Congratulations – I think you’re going to love it. If you haven’t already, please visit this post to get started: https://www.paintthekitchenred.com/instant-pot-how-to-quick-start-guide/ Enjoy! I made these tonight and found that even after increasing the cook time to 11 minutes, the majority of the cake was still liquid rather than just the center. Next time I’ll try 13 minutes. It was still very good though. I love the idea of making these lava cakes in the instant pot! I haven’t purchased one yet, but each time I read another instant pot recipe, I get closer to taking the plunge. This looks so easy and man do those lava cakes look delicious! Hi Danielle, you’ll love the Instant Pot. Just start off slow and get familiar with it by making rice or eggs. Enjoy! These sound delicious but I have a Cuisinart electric pressure cooker. How do I set it up to make them? Thank you. You would just use the High Pressure setting. Since your Cuisinart PC might cook faster, try a shorter amount of time than in the recipe and if it’s under-cooked, do it for another few minutes. I hope that answers your question. I will be making this but wanted you to know I love your detailed photos, not for me so much but for those who are new to the Instant Pot. Great job! Thanks, Margaret. It’s always a fine balance, giving too much information vs too little! I try to do both by making the recipe card less detailed. This is the second recipe I have tried and it was fantastic. Thanks. Emily – you’re welcome – so glad you liked it! Hi love his one! 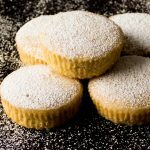 Am still getting used to my instant pot but have you made a vanilla sponge cake in yours? What’s the timing if you have made them? Would love to know your recipe for that one as well. Hi Sharan – thanks for the question. I will put that on my list of recipes to publish. Hope you’ll check back soon. I made this recipe and mine turned out more gelatinous than cakelike. It still tasted good, bit there was no molten component. Any ideas what happened? Overstirred, too much liquid stirred in, didn’t cook long enough? Hi Vic, it’s possible you needed to cook it for longer and it was undercooked. That would be my first guess. If you are up for trying it again, increase the cooking time to 9 minutes and see how that works for you. Good luck! I am giving my feedback after trying out this recipe. It’s just wonderful and I loved it. The chocolate cake is as yummy as it looks. I am glad I found this recipe. Thank you! Paul, I’m really glad you liked the recipe. Give the Instant Pot brownies a try too – minty and chocolatey! I cooked these today, following the recipe, they didnt turn out very good to tell the truth. Kind of gelatiny, rubbery, no molten center, no cake texture. I wonder what happened? Hi Mark, I’m so sorry it didn’t work out for you. So because of your comment, I made the lava cakes this morning – just to make sure I hadn’t made a mistake with the recipe. I made it in white ceramic ramekins and glass pyrex custard cups for 9 minutes. Both worked out about the same, with the ramekins being slightly more ‘done’. They all had the molten center. I was able to turn them onto a plate intact. The cake surrounding the molten part is not a ‘fluffy’ type of cake – it’s a bit dense because of pressure cooking. The filling is gooey and molten when the cake is hot. Once it cools down it does have a thick pudding consistency. It’s possibly matter of taste, but it could also be slight variations in quantity or specific brand of ingredients. I’m sorry I have no answer for you. Thanks for trying it out. Followed recipe fairly closely, but not crazy OCD. 9 minutes. Perfectly molten in the middle. Outside was a little more spongy than I am used to for lava cake, but bang for the buck – it’s a no-brainer. Thanks! Hi Brian, You’re welcome! Thanks for commenting, and I’m so glad it worked out for you. followed directions to a T but no lava……hubs still liked the taste as they were fudge like brownies…..
Hi Barbara. Hmmm. This is a recipe that confounds me. It works for me every time and there are many people who make it and get that molten lava center. Then there are some people for whom this recipe produces more of a fudgy cake like you say. I suspect it’s altitude or slight variations with different Instant Pots or pressure cookers. I’m glad the taste was good still! If you ever choose to make it again, can you try with 7 minutes and report back? Thanks for commenting! Any idea if this would work with a non-dairy non-margarine substitute (like coconut oil)? If so, would you adjust anything else? Hi there Jason – I am so sorry, but I really have no idea how it would turn out. I’ve never had experience with desserts using coconut oil. I only use coconut oil for cooking. Good luck. Looks yum! Can these be made in advance or they’ll dry out? Anuradha, They become more like a truffle or brownie upon cooling. I have made them and reheated them the next day in the microwave, and it’s still good. But I think they taste best right away. Thanks for you question! This looks absolutely delicious! I need to make 8 of them, so I’m wondering if I put the first patch in a hot water bath, would they keep the original consistency until the others are done? Thanks in advance. Hi Karen, they should be fine because your second batch will take a bit less overall time since your IP and water will be hot already. Hope you like them! I tried this today in a 3 qt instant pot. I live in Manhattan. First try, my lava cakes turned out very spongy and solid. It’s like an overcooked brownie with a lot of bounce. This was using 8 minutes high pressure in three 3 oz ramekins. I tried a second batch with leftover batter and instead cooked it for 5 minutes. The outside skirts was again very spongy and solid. The inside however was decently molten but still a tad overcooked. – texture is very spongy. – inside is getting overcooked in a 3oz ramekin. I think I might have to reduce the cooking time down to 4 minutes, and perhaps add 1 less tablespoon of flour and maybe 1 less egg yolk? Do you have any suggestions? I’m in the process of buying larger ramekins (4 oz), but I want to see if I can make this work with these 3 oz that I have. Victor – I’m sorry you had trouble with the recipe. I think the 3 quart is just fine for most recipes, but this recipe which does require some precision, the 3 quart may be overcooking the lava cakes because of the smaller size of the pot, plus the smaller size of the ramekin. FYI, the cake is actually more dense than if you baked in an oven. I think it wouldn’t hurt to try out the ideas you mentioned. Also, I wonder if refrigerating the batter for a bit might make a difference? Good luck. Followed the recipe and added 50% more to get six servings, without the coffee, using an 8qt IP., four on the bottom and two on top. It came out a little soupier than I like. Next timewould add an additional minute to the pressure cooking time. Thanks for an amazing treat. Where would I find the trivet you used? The one that came with my instant pot doesn’t have long handles like that. Thanks!! Hi Kelly – the trivet with the handles don’t come with the LUX, if that is the model you have. I see that the IP company has it on their website: https://store.instantpot.com/collections/accessories. I see one on amazon too, but it’s priced a bit higher. Hi Sher – I do use dark chocolate at times and it’s quite rich – I use Ghirardelli brand. Some people have had issues with them over or under cooking so you at least had that problem covered 🙂 Thanks for sharing. I was very excited to try this recipe – unfortunately, like a few others posted, I did not get the molten center! It did taste good, however. When it comes to this recipe, I think there are individual differences: whether it’s ingredient brand, measurement of flour, altitude, or type of Instant Pot. I would suggest that if you wanted to try it again, reduce the cooking time by a minute. Thanks for taking the time to comment. Any way you can convert this to low carb with almond flour? Hi Michelle, thanks for your question. I’m sorry, but I’ve never tried ‘baking’ in the pressure cooker with almond flour. I’m not sure whether you can do a 1 to 1 substitution. Would love it if you can let me know if you try it out. I find that measuring flour by the gram can be more precise, maybe eliminating that as a factor for a denser middle of the cake. Would you mind providing us with a gram measurement next time you make yours? Thank you! Sonia, great point. Next time I make it, I’ll make a note of weights. It appears this recipe needs some precision 🙂 Thanks for taking a moment to comment! How did you get the ramekins out with out burning yourself? Hi Angelica, I have a trivet with handles which was shipped with my Instant Pot and I usually have no trouble removing it from the Instant Pot if I wait a minute or two after opening. If you have silicone gloves, those could help remove the individual ramekin. There are also canning jar lifters (just search for those words on amazon). Thanks for your question. Can you cook this in one dish instead of the four? Cathy – thanks for your question. I suppose you could, but you’d have to change the cooking time since the cake will be so much bigger – rough guesstimate would be 30 minutes, but I really don’t know. 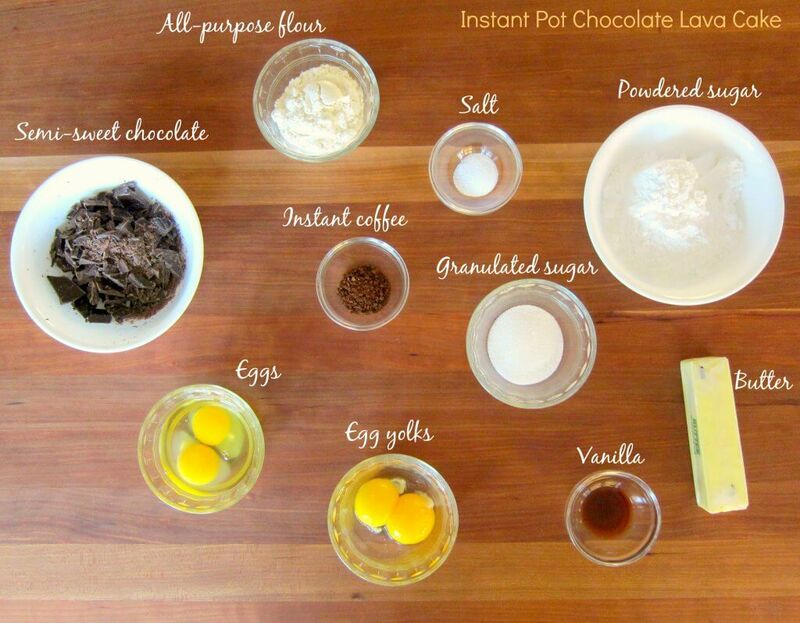 And you probably wouldn’t want a lava cake consistency, since that would be a mess – you’d get more of a brownie cake. Would it be ok to make the batter up ahead of time (the night before)? Rachel, I’ve never tried that. Since the recipe doesn’t have baking soda or powder in it,you might be able to do that. Let me know how it goes, will you? Thanks for your question. Thanks for the recipe. These were a big hit with my kids! Hi Megan – glad they liked it and thanks for your comment! So, I made this tonight exactly as written, except I used four 7 1/2 oz. ramekins, instead of the 6 oz. (It’s what I have). I have a 6 qt. Instant Pot Ultra. Three on tbe bottom and one on top. Well….they turned out perfect!!! Wish I could post a picture! Thanks for the delicious recipe. Will definitely make again! That’s so great – thank you for sharing, Lovella. I made them tonight. 6 oz ramekins, 3 on the bottom and one on top. 9 minutes high pressure with a quick release. Mine were not gooey in the middle, more spongy and moist. The taste was fine so not a total loss. Will try 7 minutes the next time. Hi Stefan – thank you for commenting. For whatever reason, some people need less time to cook these. I would love to know how 7 minutes works for you! 1st time it came out perfect, 2nd time, no lava… trying again tonight. Regardless, it’s very tasty and really easy! Hi Cindy – I sometimes suspect that it could be overheating of the chocolate. Do you think that could have been the reason i.e. microwaved the chocolate a bit too long? Best thing to do is to microwave and stir in phases until just about completely melted and then let melt in the residual heat, stirring. Might be worth a try. I also think that the measurement of ingredients is particularly important in this recipe since the quantity of flour is so small. Thank you for the comment! Cindy – did you see the reply above? If you’ve considered all those things, I would suggest cooking it for less time next time you try it, maybe a minute or even two minutes less. Did you change the brand of any of the ingredients or the container size after the first try? Hi Heather – I think they would work, but not sure about the time – you might need to adjust the pressure cooking time due to size and material. Thanks for your question. I have a question. If it is gooey in the middle, how do you know it is safe to eat? Doesn’t that mean the eggs aren’t fully cooked? I’m sure there is some easy explanation but I’m weird about undercooked food. Any explanation would be great because I cannot wait to try this recipe! Hi there Holly, I understand your concern. Because the Instant Pot reaches a very high temperature, it should be okay… but you should refrigerate any uneaten cakes. Maybe you can use pasteurized eggs, and then you don’t have to worry. There are lava cake recipes that have ganache in the middle. You could try that too. Thanks for your question. how long do you pressure cook it for? Hi lane, the recipe states 9 minutes. You may have to try it out first to see if that’s the right amount of time for your Instant Pot. WOW WOW WOW!!!! Just made this and it is heaven in my mouth as I type this!!!!! Thank you Renee for the resounding approval 🙂 I’m really happy you liked it. Glad you liked it, Gabe – it is divine! The chocolate cake is as yummy as it looks. I am glad I found this recipe. Thank you! That’s great Sasha, I’m glad you liked it as much as I do! I cooked mine for 9 minutes and came out with a spongy dry rubbery pudding – no lava. Might try it for a few less minutes once I get over the pain of failing! :-/ Tasted pretty damn good regardless! Arrgh – sorry! This recipe is a weird one; some people get it perfect, others don’t. I think there are a lot of variables: the model of IP, microwaving the chocolate (over microwaving can cause the recipe to fail), quantity of flour, etc (it’s such a small amount that being a bit off can cause issues), etc. Give it a try again if you have the patience and reduce the time to 7 minutes. Thanks for commenting.